Pattye, we are so grateful to you for your commitment to this important cause and this good news is solely because of your efforts. Your work is so important. It contributes to the well being of the community and it directly serves the people who live and work here. What kind words, thank you. This is a good start, but isn’t there something our elected officials in Tredyffrin could be doing right now to create an ordinance or something to protect the historic buildings? The fight isn’t over until that clockworks building is protected from demolition. That’s a lovely, historic structure and must be protected, before the greedy mindless turn Paoli into a cheap wasteland. How soon can a historic preservation ordinance be proposed and enacted? We have been fighting him for over 10 years in Msrple Haverford Springfield Morton and Newtown Sq. Have been trying all that time to change the state code to put more local control. Your old state rep had no interest in the bill. Believe the property is on a federal funded highway so look at the recent story about digital signs in Phila that were going to be in the right away. That could cut highway funds. Most towns hadn’t changed their codes to allow off premises signs so they would file that the local zoning code was invalid. Some towns would make a deal and others would fight him. Talk to your new rep to work with other reps to get a new bill started to put local control on signs. John Butler has a good idea. Who is our new Rep? Let’s talk to him/her to get a new bill started to make sure signs are under the area of local control. Who was the old rep? Why didn’t he/she show interest in this? Melissa Shusterman (D-157) is our PA State Representative — Republican Warren Kampf previously held the position. Please don’t ever run for public office. Your skill and talent as a community activist is way more effective and allows you to accomplish things no politician could dream of accomplishing. Very flattering :) But don’t you think that if we elect the right people they should be the public’s best advocates? All I want is for our local elected officials to listen to the community and to deliver on their campaign promises. For me, that’s say ‘no’ to digital billboards in Tredyffrin Township and to support the history of this community and to FINALLY enact a historic preservation ordinance. Thanks, Pattye, Tredyffrin Township Wonder Woman. Now that’s some label! 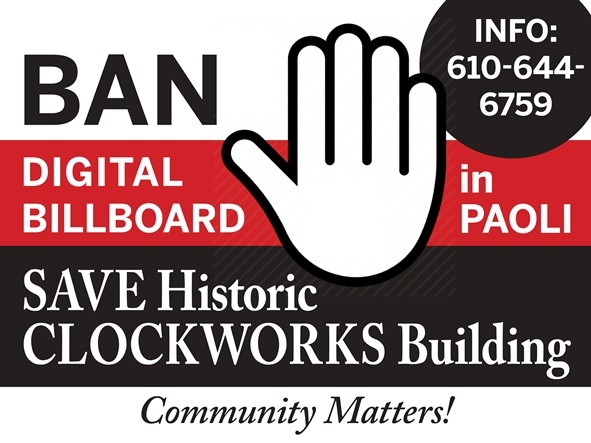 :) When I started the “Ban the Digital Billboard & Save the Clockworks Building” campaign with the BAN signs, the Change.org petition, Facebook page, etc. we knew it was going to take the entire community to make an impact! I’ve lived here a long time and I don’t ever recall another issue that has so galvanized and united — community does matter! We need good activists and good Commissioners. Good activists hold Commissioners accountable. And good Commissioners must ask themselves whether the activists are right — even when they are taking action against those very Commissioners. I am happy to help you, the community and the Supervisors pro bono to create a Tredyffrin Historic Preservation Ordinance. I am a resident for over 25 years. I am an Attorney specializing in Pro Bono work in Chester County with a Real Estate referral license. I will do it with a committee of volunteers any day of the week! I am pulling up all the adjacent Historic Ordinances including Lower Merion, Radnor, Phoenixville and more. Let’s do a petition and a Go Fund Me for that purpose! I am in Full support of banning digital if not all billboards as they are just offensive to the eye. Our Township must retain the beauty of being green and open. Although, I understand there is a commercial lease and a real estate contract, there may be contingencies which to allow either party to walk away. There could be an opportunity for owner or the Trust to think about alternative ways to donate the property for tax benefits or lease/sell to a green organization. There has been a draft historic preservation ordinance floating around the township supervisors since last Spring. It is my understanding that there has been legal review of the ordinance so I am not sure why it has not yet come in front of the public for discussion. Any historic preservation ordinance that ‘may’ come along will will be of no use for the Clockworks building as this project would be grandfathered in. I’ve spent years trying to get a historic preservation ordinance through the township but there’s never been adequate support from the Board of Supervisors. Here’s hoping that 2019 will finally be the “Year of Historic Preservation” in the township! Thanks for your offer to help! someone mentioned something about road? ownership. curious question: is Lancaster ave considered a township or state road. would this billboard be a distraction to drivers on a local or state road? if a state road, must this appeal be posed to pendot? I would think that PennDOT would need to be involved at some level with the proposed digital billboard. With the train tracks so close to the proposed digital billboard and the possible demolition of the Clockworks building – you would think that that Septa would have to sign off on the project also. Regarding the possible demolition of the building which would require the closure of Rt. 252 and 30 (and Septa??) PennDOT would have to be involved. I can’t imagine the nightmare with traffic if the intersection were to close, even briefly for demolition and additional police needed, etc. Let’s hope it doesn’t get to that point! “However, internal illumination on freestanding advertising signs is not specifically permitted,” the letter said. “Furthermore, animated signs and signs that flash are prohibited,” he said, citing township code. The billboard company has 30 days to appeal Baumann’s ruling to the Zoning Hearing Board. 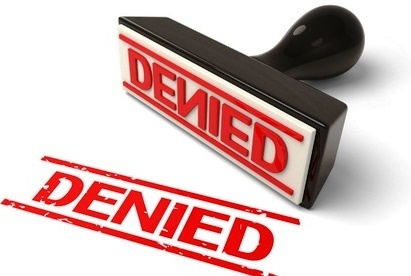 If animated signs and signs that flash are prohibited according to Zoning Officer Naumann, doesn’t that say it all and put an end to the proposal? And since Baumann is a zoning officer, wouldn’t catalyst have to go to him to appeal it? Doesn’t seem like the billboard meets township codes. I saw an “available” sign on the Clockworks property today – not sure if that means the property is for sale or if the tenant is moving out and they are looking for a new tenant?